Jack Wright, probably in the 1920s. Photo from the Mary Rackliff Etter collection. Thus Curly Wright began telling me of his father’s trapping activities in the Mattole Valley, which would’ve gone on all through the first half of the twentieth century and beyond. “Jack” or C.E. (Charles Ellsworth) Wright was born in 1880 to pioneers Martha Rudolph and Marshall Wright. 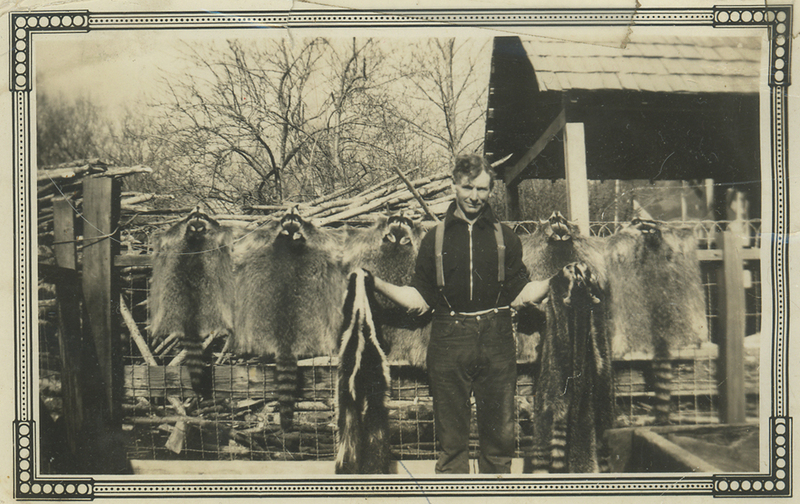 Jack was known as a carpenter who built many of the old homes in the Petrolia area, but he always said he made more in the few rainy months of fur trapping than all year in the building trade. Jack had a trap line he checked every three days. He’d set out real early to check on his hundred and some traps. He’d have the horse all ready the night before, then before light he’d throw on the saddle. He’d go up the North Fork—clear up to the Miner place. To the forks of creek, he’d go east to Edmonstons’ over the top of the ridge. The horse knew where every trap was. He had forty or fifty traps he’d check every third or fourth day, depending upon the weather. He’d go up the mountain where you can look over into Upper Mattole—then do down by Hap Stewart’s in Conklin Creek country. If he wasn’t home by 9 or 10 p.m.—way after dark in winter—his mother would send Curly up Conklin Creek Rd. He’d put his ear to the dirt to see if he could hear horse’s hooves—hear them clicking on the rocks. “Don’t get too close,” Jack would say, “or the horse will smell you and whinny.” Curly never got further than the summer cabins [upstream from the Browns’ place now, but below Conklin Creek]. He’d see the flashlight coming, but Curly “couldn’t even see the damn horse for the furs”—Jack was usually weighted down with his take. Jack would have taken the carcass out of the trap, thrown it down, and hung the hide. Sometimes he’d have twenty hides or more with him. He’d leave them hanging—it only took him three minutes or so to jerk the hides off the carcasses, when they were hot. A Colt Woodsman pistol was Jack’s favorite, and he was a dead shot. He did drive sometimes, but he knew where he could and couldn’t get with a vehicle, and he’d take his horse to get way out where his rig couldn’t go. He made awful good money in those days, depending on the season. They’d get awfully heavy—the fat on the hide was heavy. He’d bring them home alive sometimes. He had a bunch of cages outside, a line about fifty feet long, separated in a few places. He’d throw the live animals in these; sometimes a fight would happen. Sometimes (not too often) an animal would return to the same trap that’d caught it by the foot once before. Raccoons, mink and otter, bobcats (called wildcats then). 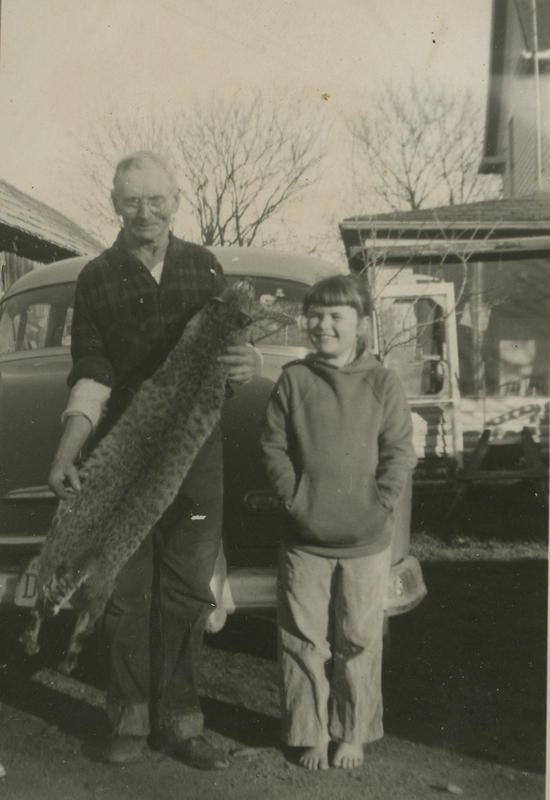 Mink—Dad would stretch out the mink on a rack. They were really expensive. The only way you would have a mink in those days was if you had a trapper friend. Jack hid those traps well… you had to know exactly where they were. He kept his tools real sharp—wouldn’t let anyone else use his pocket knife. And he had certain blades for certain jobs. Mast & Steffens, J.L. Prouty, Sears and Roebuck—they bought the furs. For good money. In the recent Now… and Then newsletter (#33; print copy available by contacting me here or at the MVHS), an article from the Humboldt Times of September 23, 1854, mentions “Grizzly Bear, Deer, Elk, and Antelope…” in our area. I noted that i wasn’t sure about the antelope, thinking of the African animal. But i kept thinking of that ultra-American folk song with the line “…where the deer and the antelope play; where seldom is heard a discouraging word…” and realized that yes, there are American antelope– but in the Mattole Valley? It would be interesting to learn more. 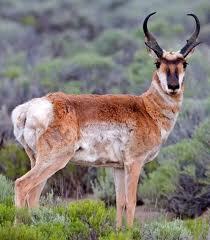 If there were any such animals here, they would be Antilocapra genus, which is not the same as the African antelope. The American antelope is commonly known as the Pronghorn (the true Antelope having single-spike horns, rather than the antler-like prongs of our genus), and its scientific name means “antelope-goat.” The Pronghorn is yet numerous in northeastern California, where hunting licenses are issued, and are one of the attractions of Yellowstone National Park in Wyoming. They seem to prefer high-desert, relatively arid grasslands… but who’s to say that the summer Mattole hills, so perfect for other ungulates, would not host a happy population. I have not seen other accounts of them here, but will keep my eyes open. populations have declined greatly from historic size and range. Antilocapra americana. If this one looks familiar, consider that these Pronghorns are more closely related to giraffes than to African antelope.